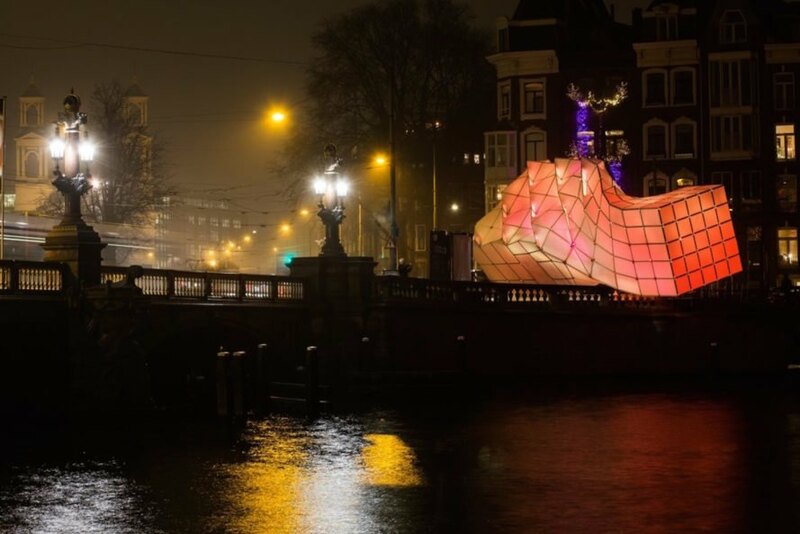 UNStudio and MDT-tex have tapped into the ocean’s murky depths for their design of the Eye_Beacon, a sculptural pavilion for the Amsterdam Light Festival. The colorful art installation draws inspiration from the bioluminescence of deep-sea creatures – and it’s illuminated with LEDs that create a pulsating, hypnotic light show. The pavilion serves as the festival’s ticketing and information booth, and it follows this year’s theme of biomimicry. Installed on the western side of the ‘Blauwburg’ next to the river Amstel, Eye_Beacon is an eye-catching pavilion that serves as the first stop for visitors to the festival. The structure also connects the ‘Watercolour’ canal route with the ‘Illuminade’ land route. The sculptural pavilion comprises two interconnected cube forms that are twisted to create a dynamic shape with 316 uneven panels. The designers used parametric optimization to determine the pavilion’s openings and complex, curved shape. 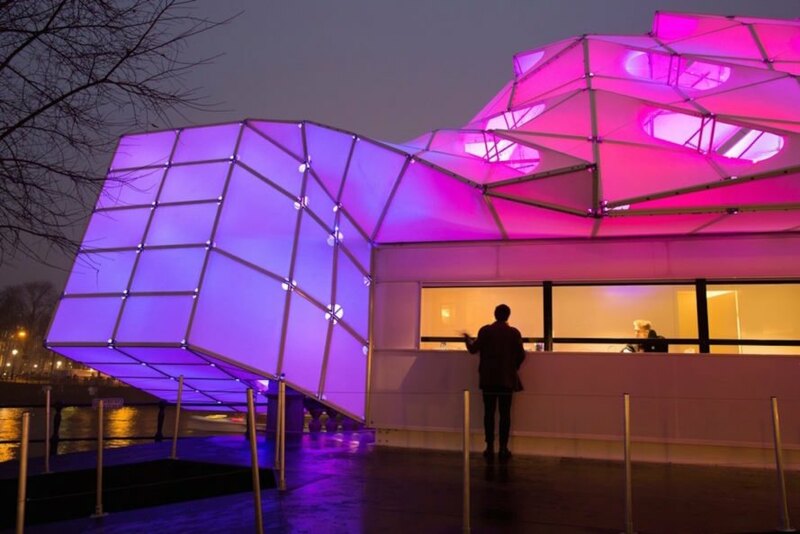 MDT-tex developed the 2D and 3D tensile textile modules that make up the pavilion. 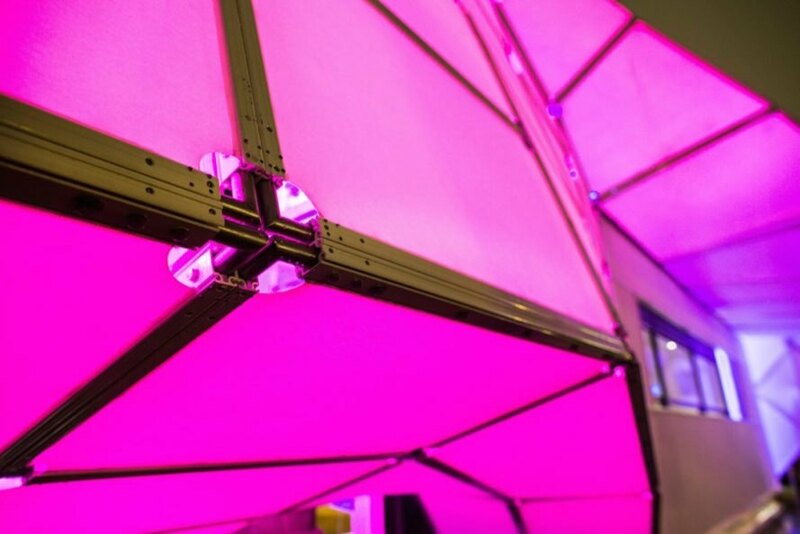 Focused LED projections on the inside of the tensile structure turn the pavilion into constantly morphing composition of light and color ranging from orange sunset hues to neon greens and blues. 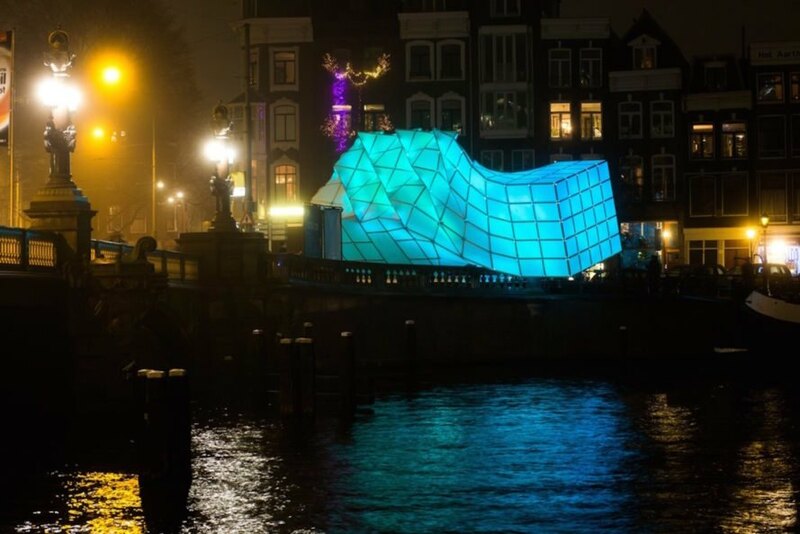 UNStudio and MDT-tex have tapped into the ocean’s murky depths for their design of the Eye_Beacon, a sculptural pavilion for the Amsterdam Light Festival. Illuminated with LEDs to create a hypnotic pulsating light show, the colorful art installation draws inspiration from the bioluminescence of deep-sea creatures. The pavilion was created as the festival’s ticketing and information booth, and follows this year’s theme of biomimicry. Installed on the western side of the ‘Blauwburg’ next to the river Amstel, Eye_Beacon is an eye-catching pavilion that serves as the first stop for visitors to the festival. The structure also connects the ‘Watercolour’ canal route with the ‘Illuminade’ land route. The sculptural pavilion comprises two interconnected cube forms that are twisted to create a dynamic shape with 316 uneven panels. The designers used parametric optimization to determine the pavilion’s openings and complex, curved shape. 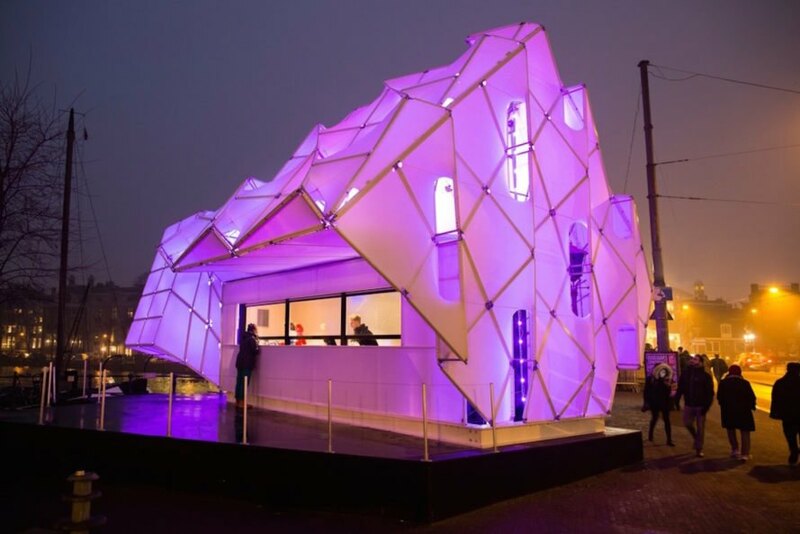 MDT-tex developed the 2D and 3D tensile textile modules that make up the pavilion. 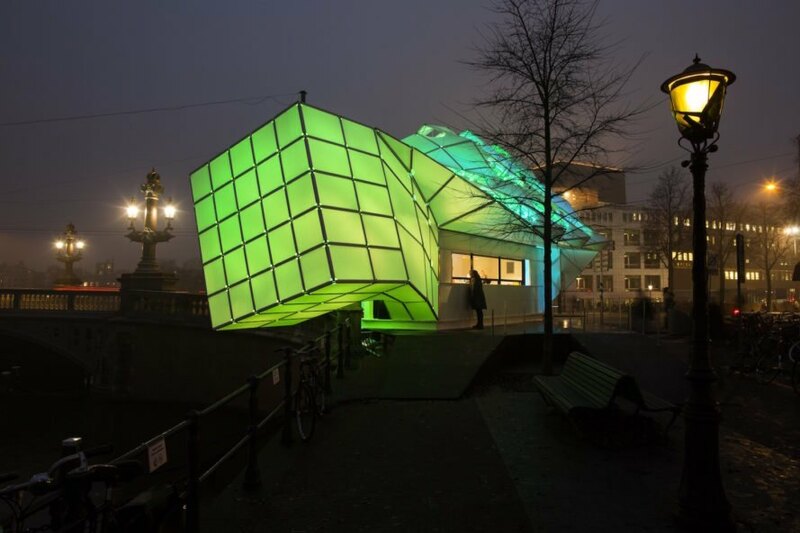 Focused LED projections on the inside of the tensile structure turn the pavilion into constantly morphing composition of light and color ranging from orange sunset hues to neon greens and blues.